It’s time to stock up! All SafeChoice Horse Feed is Buy 4, Get 1 FREE per 50lb bag at Standley Feed & Seed from February 1st to March 24th, 2017. SafeChoice Horse Feeds help improve performance and reduce metabolic concerns. Every bag of SafeChoice Horse Feed contains calorie-rich fats from vegetable oil, guaranteed amino acid levels to support muscle maintenance and development, plus added prebiotics and probiotics to aid in nutrient digestion. 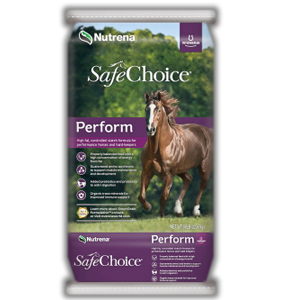 Keep your horse preforming at their best and save big on Nutrena’s Safechoice products for a limited time! Stop by Standley Feed & Seed for all your equine needs and save on Nutrena SafeChoice horse feed today. This entry was posted on Monday, February 6th, 2017 at 6:01 pm	and is filed under News & Updates. You can follow any responses to this entry through the RSS 2.0 feed. Both comments and pings are currently closed.